Okay, okay….someone was a bit behind this year on their holiday baking. And that “someone” may be a certain 5’2″ Vietnamese gal we all know and love…. Five foot, 1 inch AND three quarters…. But let’s not get stuck in the minutia of things because I’ve got cookies. 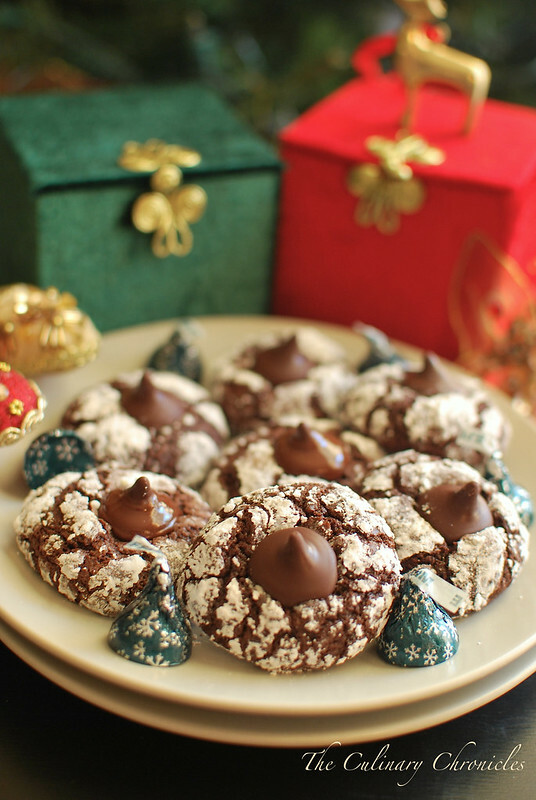 Some SERIOUS cookies that will rock your jingle-jangle, holiday socks off. When I saw these crinkle cookies from the Recipe Girl, I knew I had to have them! 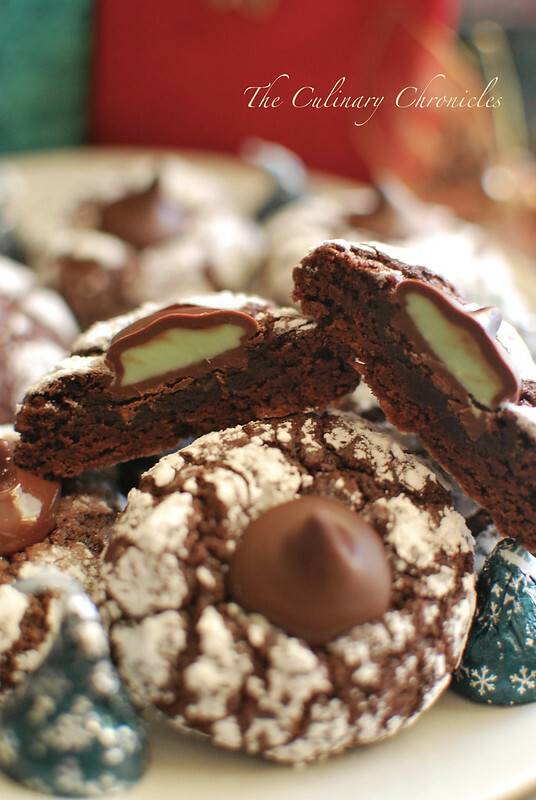 Chocolate + Mint = THE BEST PAIRING EVER!!!!!!! I hadn’t even known that Hershey made these magical little confections in the form of Dark Chocolate Mint Truffle Kisses. These little beauties are, to date — my FAVORITE of the Hershey Kisses. As for the base cookie, Recipe Girl is completely on point. 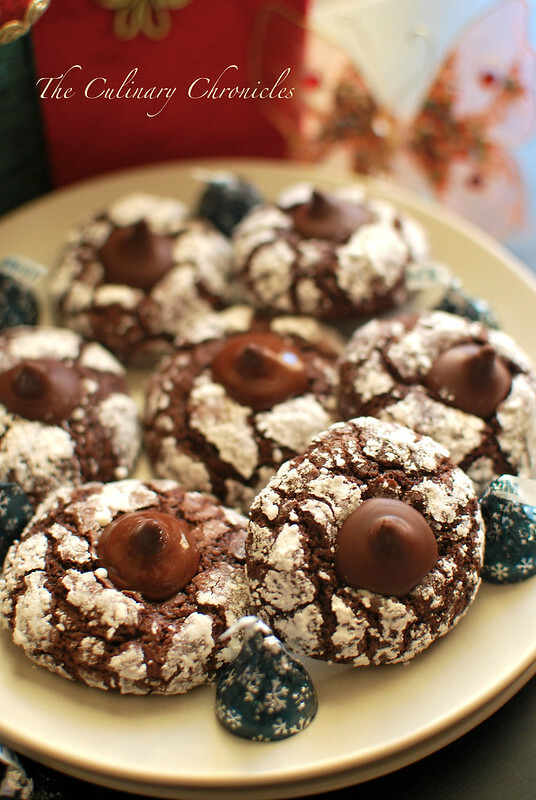 The cookie is moist, chewy, fudgy and somewhat brownie-like. The only change I made was a splash of additional vanilla extract when the mint extract goes in. And the kiss, the KISS just sends things over the top and seals the deal. So if you plan on leaving the Big Guy a plate of cookies next Wednesday night, do yourself a solid and whip up a batch of these beauties because I’m pretty darn sure that it’ll flip you to the “nice” list in a jiffy. Want the original recipe? It can be found here. ps. Two quick notes on the recipe. First, you really MUST chill the dough before rolling them out or you’ll have a hot mess on your hands. And second, if you want the cute little point of the kiss to stay intact, definitely chill the cookies on the sheet immediately after you take them out of the oven. pps. HAPPY BAKE COOKIES DAY!!!!!!! I support your rounding up that quarter inch. 🙂 Cookies look great! 🙂 Thanks Connie! Every bit counts!!! Happy Holidays!